Expansion and growth in downtown South Boston are stronger than ever. A combination of public and private investment—not any single person, business or project—has spurred a renaissance in downtown South Boston. The Town is showing signs of renewed vitality and has recently seen interest in new restaurants, specialty shops, and entertainment businesses. In 2017, the Town hosted one of the most successful Community Business Launch’s in the state, with 25 entrepreneurs, 15 pitches, and 6 winners. One year later, there are six great success stories in downtown, including a bakery, health food store/vegan cafe, expanded restaurant, personalized t-shirts and gifts store, clothing and accessories boutique, and a hybrid coffee shop/children’s boutique, as well as two new spinoff businesses, a furniture store and heating & cooling business. The Prizery continues to be a gem of vital artistic and cultural contributions in downtown and the Downtown South Boston Farmers Market is a great gathering spot this time of year for juicy cantaloupes, fresh garden vegetables, and some of the finest produce that local vendors have to offer, as well as meats and baked goods. A popular art project in downtown is a Fire Hydrant Walking Tour. Each fire hydrant has become a whimsical piece of public art as you learn about some of South Boston’s history, and the people behind it. More and more people are living well in downtown South Boston. New Brick Historic Lofts offers market-rate housing and preserves a piece of architectural tobacco heritage that is unique and authentic to South Boston. Destination Downtown South Boston was successful in saving and developing this structure. All 27 loft apartments stay full. Imperial Lofts, under construction, is set to open next month and will offer market-rate apartments, creative workspaces, and flexible storage options. A high-end comeback in downtown has the Town making big, future plans for the region to become a destination. Next on their agenda is the restoration of the John Randolph Hotel on Main Street. “We are in the design phase of the project”, says Tom Raab, South Boston’s Town Manager. Plans for the boutique hotel include 27 guest rooms, a rooftop bar and a restaurant. A boat ramp project is also on the horizon at the southern gateway to downtown as the Town starts to look at riverfront development. 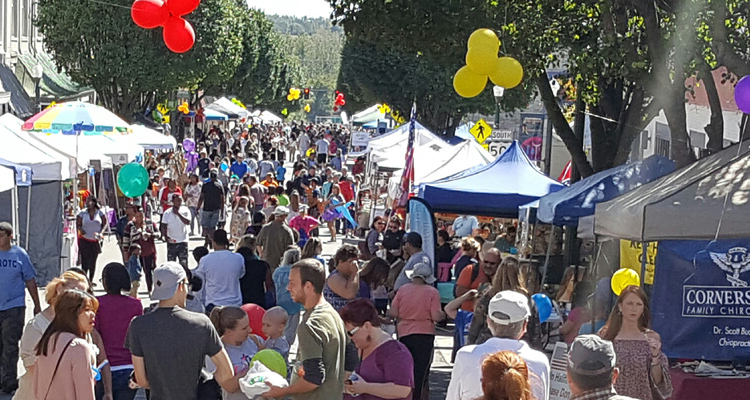 The South Boston Harvest Festival takes place on Saturday, September 29 in the heart of downtown, when Main Street is home to thousands and fills with food, entertainment, fun and, more for all ages to enjoy. So no matter whether you are living or visiting, South Boston is the place to be.